Whether in a point-to-point or point-to-multipoint configuration, your HDMI or SDI signal is carried with a low latency rate of less than 1 ms over the license-free 5 GHz frequency band. The transmitter is also capable of HDMI/SDI cross-conversion, so you can input a signal via HDMI and output through SDI on the optional receiver end or vice-versa. Small obstacles in the line-of-sight are compensated for by an adaptive signal logarithm keeping your transmitter and receiver connected. For safety, signals dropped due to interference or a loss of line-of-sight are automatically relinked within 1 ms of the obstacle being removed. Other features include signal encryption and timecode. 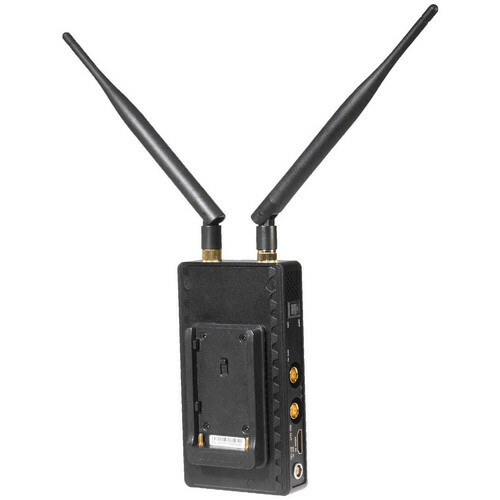 The 600M transmitter comes with two high range antennas and features a Sony L-series battery plate. Batteries are sold separately. Box Dimensions (LxWxH) 7.8 x 6.7 x 2.8"